A few weeks ago I went to visit my friend, Shaolin Master Wang Bo. Wang Bo is like a member of our family — we see him often for casual get-togethers, holiday dinners, and even the occasional family vacation. Lately, though, he has been in an introspective place, sitting in meditation for hours on end; so our visits have been less frequent. Seeing my friend was a special gift. 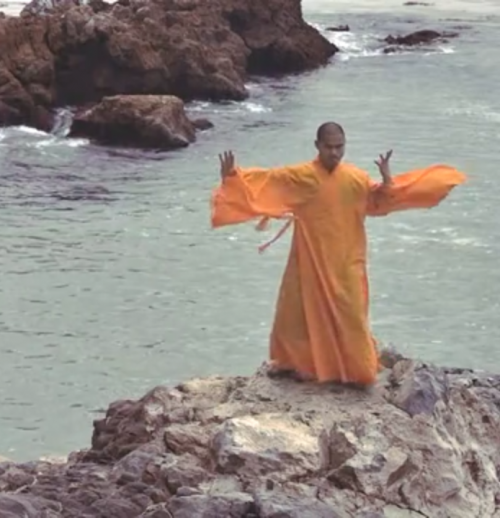 While we sipped tea, giggled and shared a few words, Wang Bo showed me a video he had recently made of himself doing Tai Chi on a bluff overlooking the crashing waves of the Pacific Ocean. It was so beautiful and majestic — his orange robes floating gracefully against the blue California sky creating the experience of watching him dance to silent music only he could hear. But it wasn’t as if he was dancing alone; rather, it was as though he was rhythmically embracing all the love and grace inside in a slow dance with his soul. When I got home I wrote that down and imposed it over a still shot from the video … “Meditation is a slow dance with your soul” … and I posted it on my Twitter and Facebook pages, then smiled while admiring my own perceived “Rumi-esque” eloquence as one of my followers messaged, much to the delight of my ego. I’ve sat with it now for a few weeks — that idea that meditation is an intimate dance with our innermost being. As my pride and ego subsided, the sensation of those words has danced … slowly … within me. And as I followed Wang Bo’s example and increased my meditation to sitting for a few hours each day, the dance has gotten slower … more beautiful … and more intimate. What began as a clever slogan from a wannabe poet of social media has morphed into a description of an experience that so captures the essence of meditation for me. Replacing the rules and postures and dogma with a portrait of a man sitting with himself for the sole purpose of experiencing the love that dwells in his soul. What could be more beautiful than that? Knowing yourself on the most intimate level? What more could we ever ask for as a result of meditation? And the only rule was to forget the rules and dance with myself … to follow my breath to the part of me beyond my thoughts … to the place that is love. When we don’t let the perceived rules get in the way, #meditation becomes the practice of learning to #love ourselves. When we don’t let the perceived rules get in the way, meditation becomes the practice of learning to love ourselves. I invite you to join me now. Put down this note and just sit with yourself. Dance with your own breath and follow it deeper and deeper inside. We are not doing a meditation, we are discovering ourselves through this motionless dance of the breath within our own hearts. Just sit … breathe … fall into love within yourself and see what you find. ian and I have just begun doing tai chi together….It is a soulful way of dancing…this is how we feel….. I am so grateful for your posts, as they are always something I can relate to, something that makes me think, and something that fits right in with our journey…. “Meditation is a Slow Dance with Your Soul”, Good God, I love that thought. Thanks for sharing this. Yesterday after reading http://jasongarner.com/?s=swimming+with+sharks, I meditated. By the end of my meditation beads, I was crying. I discovered something important somewhere within my meditation. Not my mind, or my soul, those were fine. But my body, I hated that. And I resented it too. A good portion of my life has been filled with physical pain. That story in and of itself could fill a small book with the various diseases, and more often than not: sorry we just don’t know how to help you – just deal with it; until I get so tired of spending my life at doctors that I do just that. Chronic pain sneaks up on you, and you learn to live with it until it becomes ‘normal’. However, in the last 9 weeks I’ve been unable to do the thing I love most – which is dance. For me, it’s a form of meditation. My mind forgets about everything else, there is nothing but connecting movement with music. Physically I feel the best when I dance, the pain goes away, my mind is quiet, and my soul is joyful. The last few weeks I’ve been to many doctors, with many different diagnosis of what is wrong with me, but the bottom line right now is I can’t walk, let alone dance, nor can I even stand for more than a few minutes before the pain is too much and I need to sit back down. So what do I do? I stop and breathe. I realized I’ve been ignoring my body for a long time now in a lot of ways. If I listened to it, I would be filled with pain and spend my days lying in bed. I don’t want to live my life like that. I’m a little stubborn that way. Now that dance has been taken away from me for the unforeseeable future, I need to find other ways to love myself, and hope and believe that one day I’ll dance again. It’s a fine line I walk, as I struggle with my need for self love, and dealing with the pain itself. It’s hard not to become angry and resentful. So many people take their health for granted. What I wouldn’t do to just be able to pick up a green drink and drink it without feeling sick. Loving my body through diet is hard for me, again with multiple diagnosis and ‘I just don’t know’ responses, I found I can’t tolerate many foods. It’s hard to share it too. Not only has my spray paint (for anyone not understanding that reference, read Jason’s book) programmed me to keep everything bottled up inside, but I also try to be strong for the people I love. You don’t want to burden them with the pain that you feel. You don’t want them to be scared too. But yesterday’s tweet about the swimming with the sharks made me realize that while right now things seem overwhelming, they will smooth out over the long haul. I’ve ridden pain up and down before, and I can do it again. Just as importantly, I also realized I need to love myself. All of myself. Even my body. And I need to stop ignoring all of the pain and listen to what it’s trying to tell me, at least to some degree. Ignoring pain too much for too long can cause other problems. It’s also me that I can be the one to turn to when things get bad. I want to be the one I can rely on – the one I can love. I agree! Awww Kathleen! I heart you! I’ve been feeling that way myself….I love myself but there are parts of me that I don’t necessarily like right now. I don’t like that I’m not able to be in control….especially of my body and the pain that it was going through. Sometimes I still feel it. Most of all, I don’t like the fact that I failed at some things…..but I can always say that I tried. I will continue to meditate and reflect on this. Kathleen is right….the tweets and posts help! Much love!